In rusts and indigos and the brilliant hues of a sunset, this couple is doing something no one else in Yakima is officially able to do -- they're recycling glass. It's trash becoming treasure, they say. "We're taking a discarded commodity and turning it into something people can appreciate," Bartheld explains. "It's how you look at it," he says. "When you create art out of something that's been thrown away, it draws your emotions out." The process of turning waste into a mosaic creates radiance -- one window glows with branches of a tree curling toward an azure sky, while swirls of scarlet, green, blue and white gleam in another. Creativity and sustainability are hallmarks of how Bartheld and Lester live, so it wasn't much of a leap to think about rescuing glass from the bin of eternal waste. "One of our concerns was all the glass in the landfill," Lester explains. "It takes so long to deteriorate," adds Bartheld. Because Yakima County has no outlet for recycling glass, it all gets thrown away. To Bartheld and Lester, that's close to blasphemy, especially in a pristine part of the state where 60-plus wineries serve up hundreds of glass bottles every day. The pair decided to combine their artwork with their concern for the environment. 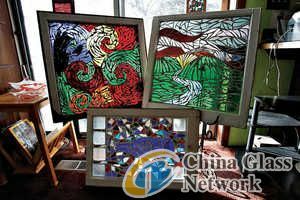 Inspired by nature -- "Everything from a rock to a craggy tree, it's all beautiful," Bartheld notes -- they began putting their artistic visions onto old windows a few months ago. The windows, themselves recycled, come from ReStore, Habitat for Humanity's local outlet for used building materials. So Bartheld and Lester were already recycling before they even started breaking glass bottles. They're refining their technique as they go along. They begin by collecting, washing and removing labels (which they recycle) from used glass. With bottles of one color, such as brown, lined up in a big vat, Bartheld covers them with a towel, then attacks with a metal post digger, smashing them into small pieces. The next step is sifting through three screens to isolate shards by size. The glass pieces are then heated in a pottery kiln until they are fused into a sheet, which takes about a day. That gives them glass with a flat edge; then they break it again into desired shapes. After drawing a design on the back of a window, they glue pieces onto the front, finishing with tile grout around the pieces. He likes crushing, she favors grouting. But, eventually, he'd like to be a little less hands-on in the breaking department and purchase a cement mixer to crush and tumble the glass. It was just a hobby until a few months ago; that's when Bartheld quit his job as a truck broker. Now they're aiming to make it their livelihood. All the glass work is done out of their home. "I got fed up with the 9 to 5 lifestyle. It wasn't very fulfilling," said Bartheld, who has been working with glass for the better part of a decade. "We talked, and we decided we can make it work. So we stepped off the ledge." They also downsized by selling a house and a car. Lester, 35, who has a master's degree in biology from Central Washington University, runs a personal finance business on the side. Bartheld, 29, who has a degree in communications from CWU, is trained in glass blowing and pottery making. Both are graduates of East Valley High School. Fellow artist Eileen Mathews is impressed with their work and their intent. A retired teacher who does glass enameling, Mathews says, "I love the fact that they're recycling glass." She points out that the mosaic windows are "very attractive. They have a real nice balance of color." Color is of the essence. A trip to the grocery store can cause impulse buying, especially if Bartheld or Lester spots a blue bottle. Green, clear and brown glass are prevalent, but they're always searching for more unusual shades. In their tree mosaic, they used glass from root-beer bottles for the trunk, with shards from a Kahlua bottle providing darker contrast. Greens came from Champagne and Chardonnay bottles, blues from a Riesling. They admit they can't drink all those spirits themselves, so they collect outcasts from friends and relatives. "Once we started using recycled glass, karma has been on our side. People have been giving us all different kinds of glass," Bartheld notes. One prize was an old Coca-Cola bottle with a slight blue hue. Bartheld's favorite glass tint is cobalt, which is hard to find; Lester favors Heineken green. Many of their pieces are large, measuring 3 or more feet square. Others are small, 6 by 3 inches. They're designed to be hung indoors or out. Their tree mosaic, about 6 square feet, contains more than 20 pounds of recycled glass. Some day they hope to provide a recycling service for the community -- picking up used glass and crushing it for artwork and other uses, such as linings for garden paths.